They are complete. After all of the futzy work of the Prickly Pear socks, at this point, I’m asking myself, “Self, why do you keep making these lacy socks that take forever to knit? Why not just get self striping yarn and just make those in stockinette?” To which I reply, “Look self, it’s because these socks are so pretty!” And they are. Don’t get me wrong, they’re not perfect. I made them a little too wide (too many toe increases) and a little long (I wanted a deeper gussets). But I like the way they fit and I love the way they look. It still amazes me that I can create something that looks so complicated and realize it’s actually not. This sock is actually a compilation of two different patterns. 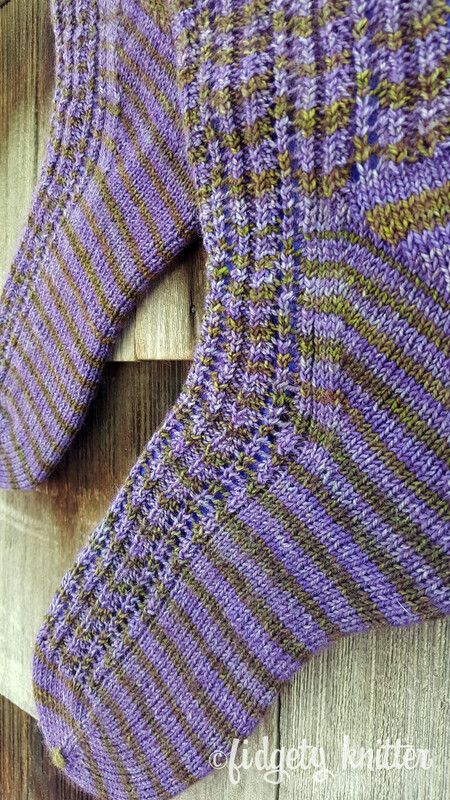 The basic foundation of this sock is based on a pattern from an ebook I purchased from KnitFreedom. Unfortunately I can’t seem to find the ebook, Mastering Magic Loop Socks, on her website any more because I highly recommend it. The foundation of the sock is the Beginner Toe Up Socks for Magic Loop. Always two at a time because I can’t imagine knitting socks or mitts one at a time any more. This is a simple pattern with a “Fleegle Heel.” This is a VERY easy heel to knit, easier than the one used on the Prickly Pear socks, though not quite as pretty. For the toe, I used Judy’s Magic Cast-On. This is a really pretty cast on, but can be tricky. If you look at the toes on my Sorta Peaky socks, you will see that I messed up. Really, though, if you’re looking that close at my toes, it better be because a foot massage is about to begin. 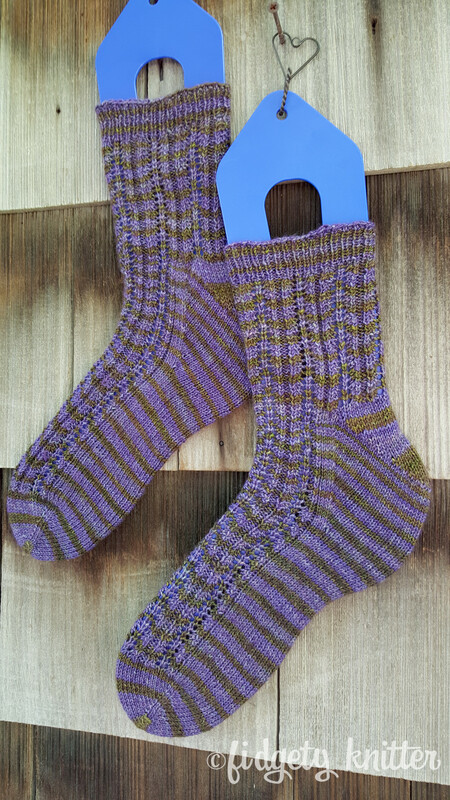 The stitch pattern of the sock is Peaks ‘n’ Valleys from the book Knit Socks! 15 Cool Patterns for Toasty Feet. It’s a top down pattern and I wanted to see if I could make this toe up. 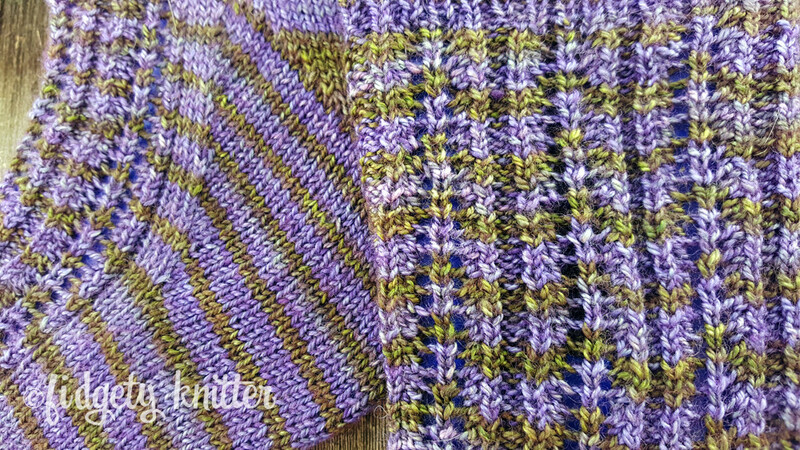 But really, the pattern is a two-row repeat that I just, well, repeated over and over and over and over… I did have to adjust the pattern as I went along to make sure I had the right number of stitches at each sock phase but I think it looks seamless. I used the K1,Ktog-tbl Bindoff. Sounds fancy, but it’s really quite pretty. Possibly my favorite bind off. That beautiful yarn is ModeWerk from ModeKnit Yarn. This is a beautiful yarn and clearly it’s striping is evenly spaced throughout the yarn as I knit these two socks from either end of the same ball of yarn. Right before the heel the striping slipped off slightly (by about a row), but you can’t tell unless you hold them right next to each other. This is a twisty yarn, but very nice to knit with. The label says it’s a super wash Merino but I washed and blocked on the form this first time around. Also, I forgot to look at the label until after I had washed and blocked the socks by hand. This sock did take a long time to knit. They were knit on a #1 US needle. I think my next pair will be something super simple in a self striping yarn to get a better sense of how long it takes for me to knit basic socks and see if I really am just a slow sock knitter. What do you have on your needles tonight? These are beautiful! Thank you so much for making our yarn look good, you are an exceptional knitter! Thank you so much. And thank you for making such a great yarn! This yarn wears so nicely and I still love the colors!